I was reading a couple of weeks back that Tesla have a new electric car for the family, in the form of the Tesla Model S. Perhaps a little more under powered than the Tesla Roadster they certainly are tackling it the right way with a 45 minute recharge and range of up to 450+ kilometres. Initial design and development went into the Roadster and sold at a prestige price to help build their business and develop their technologies even further so that they may build and sell more electric cars to a larger audience at gradually more realistic prices. The number of sales locations are definitely increasing and with electric cars that look as good as these, and peform as well, if not better than your traditional oil burner, who wouldn’t want one. BMW have unveiled a electric mini named the “Mini E” that features a 150-kilowatt (204 horsepower) motor and a top speed of just over 150 km/h and a range of up to 240 km’s. 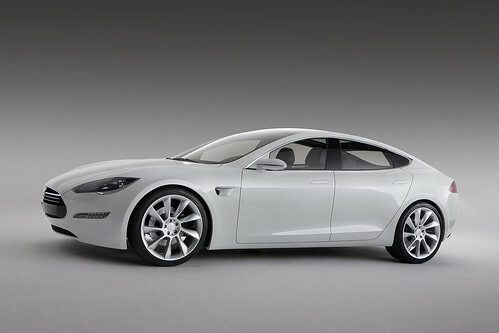 Not as quick as the Tesla reaching from 0 – 100 km/h in 8.5 seconds but just as many seats. The back seats have been removed to accommodate the battery, which in turn has led to a slightly heavier Mini with a 50-50 front/rear weight ratio. Interesting to note that even though charging the Mini E requires generation from another power source, that even if that power source is a coal powered station, it will still produce less CO2 than internal combustion vehicles.